A modern IRIS-T air-to-air missile of the German Air Force. A Royal Air Force AIM-132 ASRAAM on a Eurofighter Typhoon. An air-to-air missile (AAM) is a missile fired from an aircraft for the purpose of destroying another aircraft. AAMs are typically powered by one or more rocket motors, usually solid fuelled but sometimes liquid fuelled. Ramjet engines, as used on the MBDA Meteor (currently in development), are emerging as propulsion that will enable future medium-range missiles to maintain higher average speed across their engagement envelope. Air-to-air missiles are broadly put in two groups. Those designed to engage opposing aircraft at ranges of less than 30 km are known as short-range or "within visual range" missiles (SRAAMs or WVRAAMs) and are sometimes called "dogfight" missiles because they emphasize agility rather than range. Most use infrared guidance and are called heat-seeking missiles. In contrast, medium- or long-range missiles (MRAAMs or LRAAMs), which both fall under the category of beyond visual range missiles (BVRAAMs), tend to rely upon radar guidance, of which there are many forms. Some modern ones use inertial guidance and/or "mid-course updates" to get the missile close enough to use an active homing sensor. The air-to-air missile grew out of the unguided air-to-air rockets used during the First World War. Le Prieur rockets were sometimes attached to the struts of biplanes and fired electrically, usually against observation balloons, by such early pilots as Albert Ball and A. M. Walters. Facing the Allied air superiority, Germany in World War II invested considerable effort into missile research, using the R4M unguided rocket first and later the first guided rockets like the Ruhrstahl X-4. Post-war research led the Royal Air Force to introduce Fairey Fireflash into service in 1955 but their results were unsuccessful. The US Navy and US Air Force began equipping guided missiles in 1956, deploying the USAF's AIM-4 Falcon and the USN's AIM-7 Sparrow and AIM-9 Sidewinder. The Soviet Air Force introduced its Kaliningrad K-5 into service in 1957. As missile systems have continued to advance, modern air warfare consists almost entirely of missile firing. The faith in Beyond Visual Range combat became so pervasive in the US that early F-4 variants were armed only with missiles in the 1960s. High casualty rates during the Vietnam War caused the US to reintroduce autocannons and traditional dogfighting tactics but the missile remains the primary weapon in air combat. In the Falklands War British Harriers, using AIM-9L missiles provided by the United States, were able to defeat faster Argentinian opponents. Since the late 20th century all-aspect heat-seeking designs can lock-on to a target from various angles, not just from behind, where the heat signature from the engines is strongest. Other types rely on radar guidance (either on-board or "painted" by the launching aircraft). A conventional explosive blast warhead, fragmentation warhead, or continuous rod warhead (or a combination of any of those three warhead types) is typically used in the attempt to disable or destroy the target aircraft. Warheads are typically detonated by a proximity fuze or by an impact fuze if it scores a direct hit. 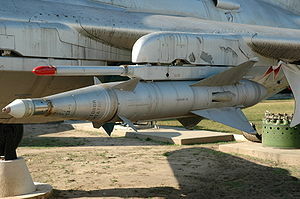 Less commonly, nuclear warheads have been mounted on a small number of air-to-air missile types (such as the AIM-26 Falcon) although these are not known to have ever been used in combat. 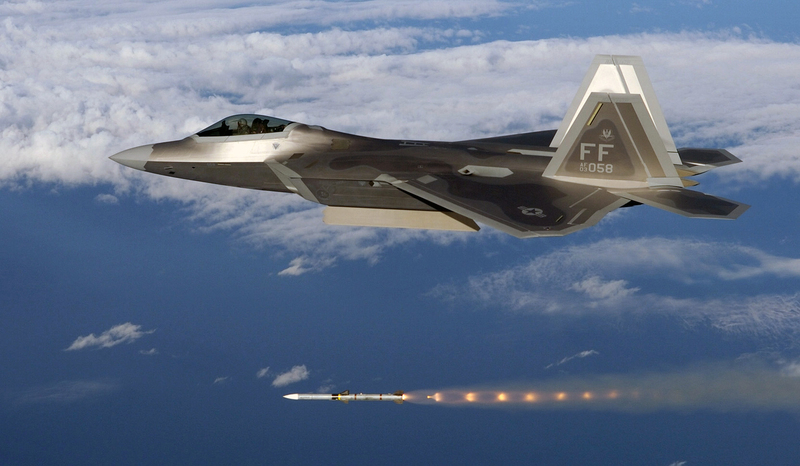 Lockheed Martin is working on a hit to kill missile for air to air combat. By removing the warhead they could enable the carriage of more missiles in the size constrained weapons bays of Fifth-generation jet fighters. AIM-9L Captive Air Training Missile (CATM) with inert warhead and rocket motor for training purposes. Guided missiles operate by detecting their target (usually by either radar or infrared methods, although rarely others such as laser guidance or optical tracking), and then "homing" in on the target on a collision course. Although the missile may use radar or infra-red guidance to home on the target, the launching aircraft may detect and track the target before launch by other means. Infra-red guided missiles can be "slaved" to an attack radar in order to find the target and radar-guided missiles can be launched at targets detected visually or via an infra-red search and track (IRST) system, although they may require the attack radar to illuminate the target during part or all of the missile interception itself. Radar guidance is normally used for medium or long range missiles, where the infra-red signature of the target would be too faint for an infra-red detector to track. There are three major types of radar-guided missile - active, semi-active, and passive. Radar guided missiles can be countered by rapid maneuvering (which may result in them "breaking lock", or may cause them to overshoot), deploying chaff or using electronic counter-measures. Active radar (AR)-guided missiles carry their own radar system to detect and track their target. However, the size of the radar antenna is limited by the small diameter of missiles, limiting its range which typically means such missiles are launched at a predicted future location of the target, often relying on separate guidance systems such as Global Positioning System, inertial guidance, or a mid-course update from either the launching aircraft or other system that can communicate with the missile to get the missile close to the target. At a predetermined point (frequently based on time since launch or arrival near the predicted target location) the missile's radar system is activated (the missile is said to "go active") and the missile then homes in on the target. If the range from the attacking aircraft to the target is within the range of the missile's radar system the missile can "go active" immediately upon launch. An advantage of SARH guided missiles is that they are homing on the reflected radar signal so accuracy actually increases as the missile gets closer because the reflection comes from a "point source": the target. Against this, if there are multiple targets, each will be reflecting the same radar signal and the missile may become confused as to which target is its intended victim. The missile may well be unable to pick a specific target and fly through a formation without passing within lethal range of any specific aircraft. Newer missiles have logic circuits in their guidance systems to help prevent this problem. At the same time, jamming the missile lock-on is easier because the launching aircraft is further from the target than the missile, so the radar signal has to travel further and is greatly attenuated over the distance. This means that the missile may be jammed or "spoofed" by countermeasures whose signals grow stronger as the missile gets closer. One counter to this is a "home on jam" capability in the missile that allows it to home in on the jamming signal. An early form of radar guidance was "beam-riding" (BR). In this method the attacking aircraft directed a narrow beam of radar energy at the target. The air-to-air missile was launched into the beam where sensors on the aft of the missile controlled the missile, keeping it within the beam. So long as the beam was kept on the target aircraft, the missile would ride the beam until making the interception. While simple in concept, the difficulty of simultaneously keeping the beam solidly on the target (which couldn't be relied upon to cooperate by flying straight and level), continuing to fly one's own aircraft, all the while keeping an eye out for enemy countermeasures, can be readily appreciated. More modern infra-red guided missiles can detect the heat of an aircraft's skin, warmed by the friction of airflow, in addition to the fainter heat signature of the engine when the aircraft is seen from the side or head-on. This, combined with greater maneuverability, gives them an "all-aspect" capability, and an attacking aircraft no longer had to be behind its target to fire. Although launching from behind the target increases the probability of a hit, the launching aircraft usually has to be closer to the target in such a tail-chase engagement. Towed decoys which closely mimic engine heat and infra-red jammers can also be used. Some large aircraft and many combat helicopters make use of so-called "hot brick" infra-red jammers, typically mounted near the engines. Current research is developing laser devices which can spoof or destroy the guidance systems of infra-red guided missiles. See Infrared countermeasure. Start of the 21st century missiles such as the ASRAAM use an "imaging infrared" seeker which "sees" the target (much like a digital video camera), and can distinguish between an aircraft and a point heat source such as a flare. They also feature a very wide detection angle, so the attacking aircraft does not have to be pointing straight at the target for the missile to lock on. The pilot can use a helmet mounted sight (HMS) and target another aircraft by looking at it, and then firing. This is called "off-boresight" launch. For example, the Russian Su-27 is equipped with an infra-red search and track (IRST) system with laser rangefinder for its HMS-aimed missiles. In order to maneuver sufficiently from a poor launch angle at short ranges to hit its target, missiles are now employing gas-dynamic flight control methods such as vectored thrust, which allow the missile to start turning "off the rail", before its motor has accelerated it up to high enough speeds for its small aerodynamic surfaces to be useful. A recent advancement in missile guidance is electro-optical imaging. The Israeli Python-5 has an electro-optical seeker that scans designated area for targets via optical imaging. Once a target is acquired, the missile will lock-on to it for the kill. Electro-optical seekers can be programmed to target vital area of an aircraft, such as the cockpit. Since it does not depend on the target aircraft's heat signature, it can be used against low-heat targets such as UAVs and cruise missiles. However clouds can get in the way of electro-optical sensors. Evolving missile guidance designs are converting the anti-radiation missile (ARM) design, pioneered during Vietnam and used to home in against emitting surface-to-air missile (SAM) sites, to an air intercept weapon. Current air-to-air passive anti-radiation missile development is thought to be a countermeasure to airborne early warning and control (AEW&C - also known as AEW or AWACS) aircraft which typically mount powerful search radars. Due to their dependence on target aircraft radar emissions, when used against fighter aircraft passive anti-radiation missiles are primarily limited to forward-aspect intercept geometry. For examples, see Vympel R-27, Brazo, and AIM-97 Seekbat. Modern missiles use "low-smoke" motors — early missiles produced thick smoke trails, which were easily seen by the crew of the target aircraft alerting them to the attack and helping them determine how to evade it. The CAS is typically an electro-mechanical, servo control acuation system, which takes input from the guidance system and manipulates the airfoils or fins at the rear of the missile that guide or steers the weapon to target. 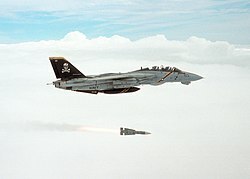 A US Navy VF-103 Jolly Rogers F-14 Tomcat fighter launches an AIM-54 Phoenix long-range air-to-air missile. Photo courtesy U.S. Navy Atlantic Fleet. Missiles are often cited with their maximum engagement range, which is very misleading. A missile's effective range is dependent on factors such as altitude, speed, position, and direction of the target aircraft as well as those of the attacking aircraft. For example the Vympel R-77 has stated range of 100 km. That is only true for a head-on, non-evading target at high altitude. At low altitude, the effective range is reduced by as much as 75%–80% to 20–25 km. If the target is taking evasive action, or in stern-chase position, the effective range is further reduced. See Air-to-Air missile non-comparison table for more information. The effective range of an air-to-air missile is known as the "no-escape zone", noting the range at which the target can not outrun the missile once launched. A number of terms frequently crop up in discussions of air to air missile performance. A closely related term is the A-Pole. This is the slant range between the launch aircraft and target, at the time of interception. The greater the F-Pole, the greater the confidence that the launch aircraft will achieve air superiority with that missile. Short-range air-to-air missiles used in "dogfighting" are usually classified into five "generations" according to the historical technological advances. Most of these advances were in infrared seeker technology (later combined with digital signal processing). Early short-range missiles such as the early Sidewinders and Vympel K-13 (AA-2 Atoll) had infrared seekers with a narrow (30 degree) field of view and required the attacker to position himself behind the target (rear aspect engagement). This meant that the target aircraft only had to perform a slight turn to move outside the missile seeker's field of view and cause the missile to lose track of the target ("break lock"). Second generation missiles utilized more effective seekers that improved the field of view to 45 degrees. The Vympel R-73 (AA-11 Archer) entered service in 1985 and marked a new generation of dogfight missile. These missiles employed more advanced seeker technologies such as focal plane arrays that improved resistance to infrared countermeasures (IRCM) such as flares and increased off-bore sight capability to in excess of 60 degrees, i.e. a 120 degree field of view. To take advantage of the increased field-of-view that now exceeded the capabilities of most aircraft radars also meant that helmet mounted sights gained popularity. 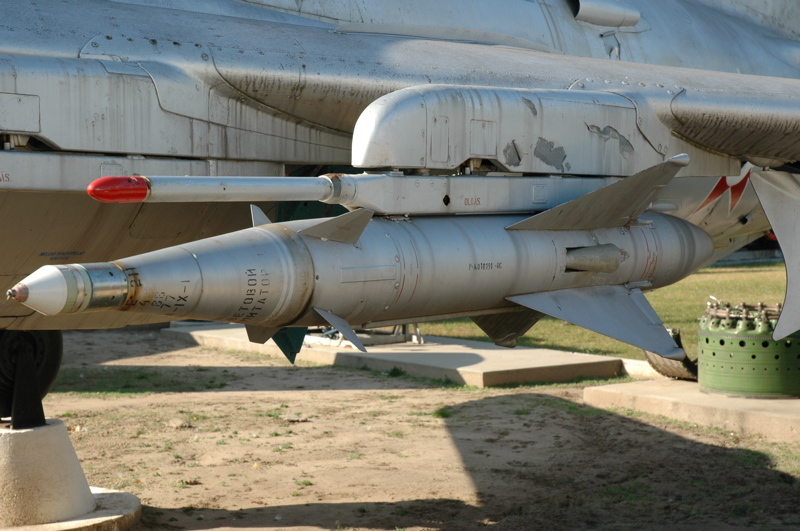 Many newer missiles include what is known as "look-down-shoot-down" capability, as they could be fired onto low flying planes that would formerly be lost in ground clutter. These missiles are also much more agile, some by employing thrust vectoring (typically gimballed thrust). greater infrared counter countermeasures (IRCCM) ability, by being able to distinguish aircraft from infrared countermeasures (IRCM) such as flares. MAA-1B Piranha — IR guided missile. Matra Magic II — IR guided missile. Alenia Aspide — Italian manufactured version of the AIM-7 Sparrow, based on the AIM-7E. PL-1 — PRC version of the Soviet Kaliningrad K-5 (AA-1 Alkali), retired. PL-2 — PRC version of the Soviet Vympel K-13 (AA-2 Atoll), which was based on AIM-9B Sidewinder. Retired & replaced by PL-5 in PLAAF service. PL-3 — updated version of the PL-2, did not enter service. PL-5A — semi-active radar-homing AAM intended to replace the PL-2, did not enter service. Resembles AIM-9G in appearance. PL-5E — All-aspect attack version, resembles AIM-9P in appearance. PL-10 — semi-active radar-homing medium-range missile based on the HQ-61 SAM,  often confused with PL-11. Did not enter service. PL-11A — Improved PL-11 with increased range, warhead, and more effective seeker. The new seeker only requires fire-control radar guidance during the terminal stage, providing a basic LOAL (lock-on after launch) capability. PL-11B — Also known as PL-11 AMR, improved PL-11 with AMR-1 active radar-homing seeker. Skyflash — medium-range radar-guided missile based on the AIM-7E2, said to have quick warm-up times of 1 to 2 seconds. MBDA Meteor — long range radar guided missile due to enter service in 2013. ↑ Albert Ball VC. pp. 90–91. ↑ "Lockheed working on new air-to-air hit-to-kill missile." ↑ 6.0 6.1 Carlo Kopp (April 1997). "Fourth Generation AAMs - The Rafael Python 4". http://www.ausairpower.net/TE-Gen-4-AAM-97.html. Retrieved 2007-03-08. ↑ Carlo Kopp (August 1998). "Helmet Mounted Sights and Displays". http://www.ausairpower.net/hmd-technology.html. Retrieved 2007-03-08.